These are great. First, the gap on the passenger side is sort of large and Cindy is always dropping things that go down in that space - occasionally never to be seen again! This solves that. 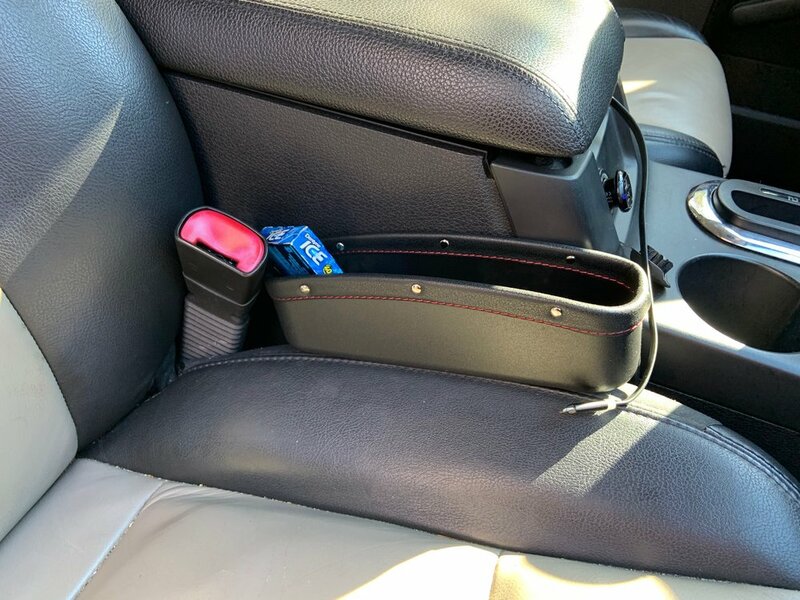 Second, the gap is much smaller on the drivers side but I want access to my sun glasses, glass cloth and a place to put my phone. This solves that. They fit well, don’t move around, don’t interfere with seat belts or space to sit, look nice and are rather cheap. Why the savings on one dropped ear ring, well you get it. I really like these and wish I had bought them earlier and am ordering a set for the car as well. Passenger side. They come in different finishes too. 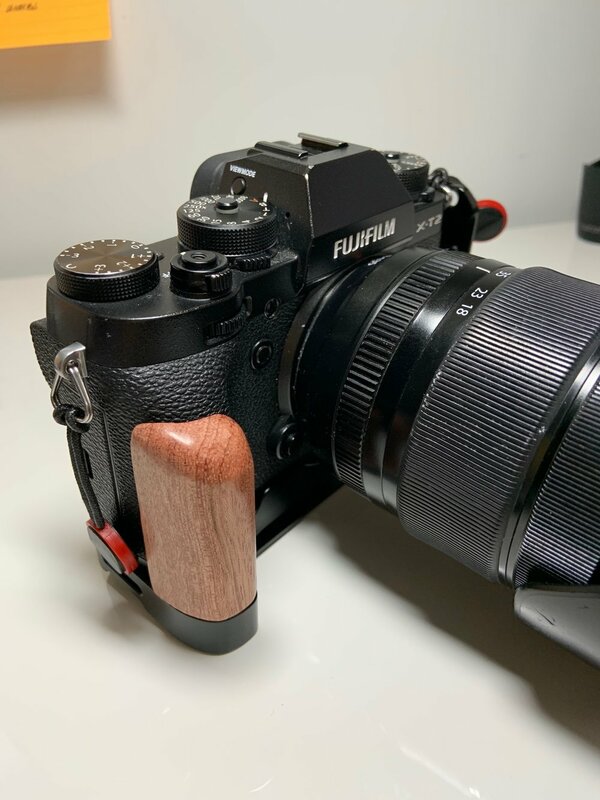 Encouraged by Dennis Mook (The Wandering Lensman) and my grandson, (KellenHIlemanPhotography on Instagram) I purchased an “L” bracket to use with my Fuji X-T2. 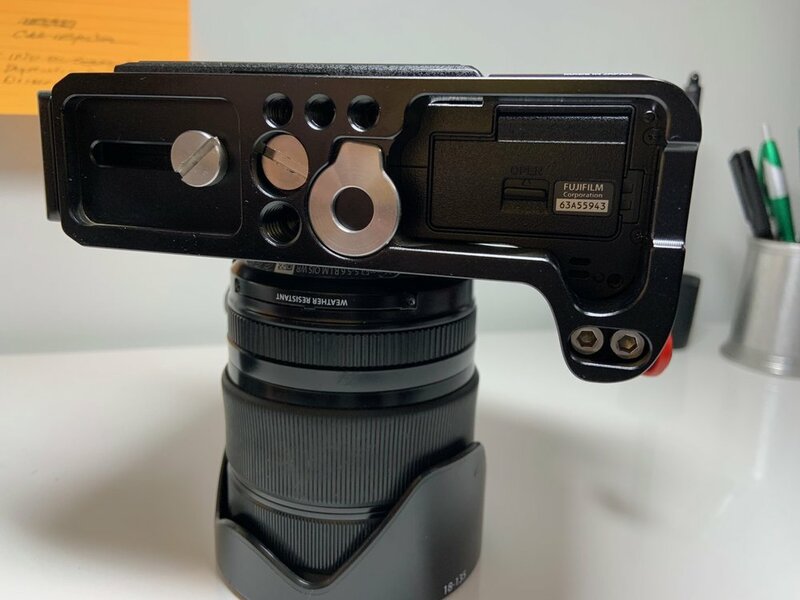 The L bracket provides an much easier method to move from portrait to landscape mode by repositioning your camera on the tripod. Many of these are very expensive - at least to me them seem to be. However, this one by Small Rig was not. And it is very well made, fits perfectly, allows access to the battery compartment and, bonus, it adds a bit of an extra grip for your fingers. Double bonus, the extra grip is wood and looks great. I have used it several times and already love it. It is light, finished well and simple to install and use. Perfect product. First you need to know both of us really like good coffee. Second, I am frugal! Third, paying a lot to take care of the first point creates significant tension in point two. Sometimes point 1 wins and I am happy. This scared and battle-tested coffee pot cost more than any three I had owned to that point. And this one was on sale AND I had a $50 coupon. Still paid more than $100 and that was hard. What is not hard is still having the same pot still making good coffee at the right temperature 9 years later. We use filtered water, good coffee and a gold filter with the timer set for the coffee to come on after 6 in the morning. This maker does not have a heated plate but uses a thermal pot, a feature we actually sought out. I hate the taste of coffee left on a hot plate too long. The company still produces coffee makers but I am not sure where they are made or if they have the same quality. For example the MT900 their most expensive model retails less than this one. So I am skeptical but I would likely trust buying another one if needed. This is a bit late because I misplaced the business card. Yet even late, I want to express my thanks and appreciation to Bill at Bradford RV for the work he did on our trailer. To recap our long saga, as much as we like the trailer our heat has been a disappointment. We were in Maine, it was cold the heat worked only randomly. We were in the mountains of the Western US and the heat was on only randomly. We were cold and it was not pleasant. Meanwhile two trips to the plant in Tennessee did not fix the issue even though they had the RV for three months the second time. Off to Maine again, assured it was fixed and, you guessed it no heat in Massachusetts and we were cold, again. Called an RV place, they could see us in three weeks. Really! Called Bradford RV, got Bill. He said, bring it in I will see what we can do to get you back on the road. They were very busy, I am sure it was not easy to adjust for us but they did. We left it, drove to New Bedford to tour and mid-afternoon Bill called to say it was fixed. What did he do? Well he determined what the problem was but could not get the part. So, he disassembled the pre-starter mechanism (Not what it is really called but better than doohickey) and re-calibrated it. Three weeks of cold wet travel with heat. Bill you saved our trip and our plans for Alaska. I just got a service bulletin from Oliver on a possible issue that they will resolve unrelated to the heat system. It more than crossed my mind that we could go to Alaska via Bradford RV. We are so grateful to them, to Bill and the nice way we were treated. 4000 miles of bugs and grime gone is 30 minutes. This photo is from before the washing of the trailer, after just BugsN’All. As often my intentions and reality collide and so far only one “Things….” post has been completed. I have several more posts to do but other critical things (work takes up a lot of time:) keep getting in the way. So, here is one I have wanted to write for a while. 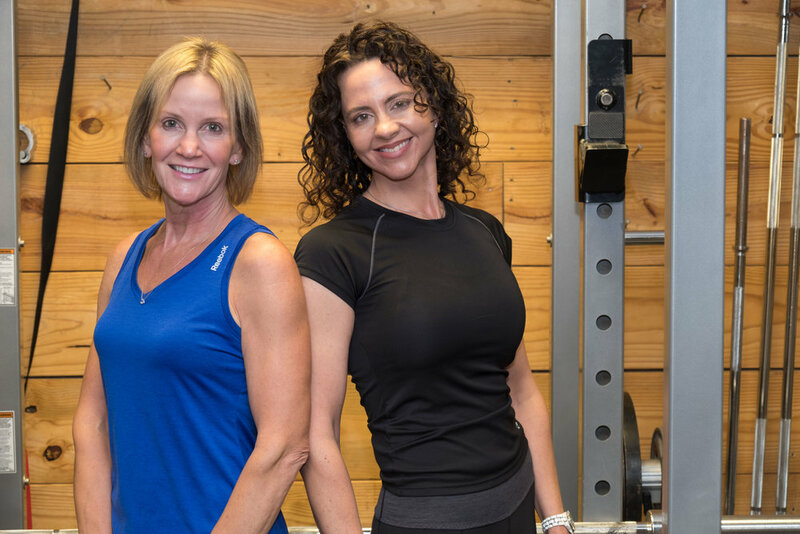 I am using North Raleigh Fitness as my example because that is where Cindy and I go - and would highly recommend it if you live here, but the primary point is go. You need to figure out what you need to be healthier. (I wrote about this once before in June 21 in the Journey’s section.) I just completed a year at NRF and Cindy about six months and simply wish to tell you that it is well worth it. I am stronger, have better posture, improved balance and all that was evident in our last hike at Pemetic Mountain in Maine. In my case, I wanted three things: 1. A personal trainer - avoidance of pain and mistakes was critical to me and I had never been in a gym so I needed guidance. 2. A place that was safe for us both and accepting of a novice. 3. A trainer who understood my goals and my limitations and worked with me. I got all that and much more with Myra and North Raleigh Fitness. The gym is clean, well-equipped and well run and the focus is on core exercises, strength and balance training. A good trainer develops a program for you and moves you along at a pace that is both challenging and rewarding. Myra even came to our trailer and developed core exercises we could do in a 90 square foot living space while we are traveling. If you wonder if it is too late to start, my own experience says “Not at all.” Even if the last time you were in a gym was 10th grade and 50 years flowed along, GO. A critical need for all of humankind is good, hot (or cold) coffee, (Or tea, I guess, Rusty.) certainly we all agree on that - and they don't think we are united! I have a drawer full, actually since we moved they were all tossed, of poorly made, drippy, unpleasant or just "did not work” travel mugs. Then I found this one, Zojirushi. They were way more than I ever paid for one (might be the initial problem) but claimed that they would not drip and stay hot. So I spent about $22 on one. On Amazon they are more or less today depending on color. It worked and worked more than well. I have to cool the coffee off slightly if I want to drink it in the first 2 hours or it is too hot. I have had coffee sit in the car for 6 or 7 hours and then drink a perfectly acceptable coffee. I bought CJH one too and we have used them for three or four years now. Clean well, still seal, no leaks or drips. Very happy. I do occasionally put iced coffee in and it works equally well at keeping it cold - no ice needed if I pour from the fridge. They are not for carbonated beverages.